For many years, scuba diving was my primary sport. In scuba diving, “vis” is the word. Short for visibility, the “vis” is expressed in feet. Thirty feet of vis means you can see approximately thirty feet. Of course, the current “vis” is always someone’s opinion. One diver’s thirty foot of visibility was another diver’s twenty feet. When calling the dive shop before the trip, the question was always “What’s the vis?” and the answer was always “great!”, of course. It’s like asking a guide about the weather, for some reason it’s always good and then when you arrive, you hear “It WAS good, yesterday”. Funny how that happens. When it comes to fly fishing, a good friend and fly fisher, “Catch” Cormier, has a list of fly fishing “laws” and, like Si Robertson of Duck Dynasty, I think he may have a lot of rule number ones, but I have heard many times that Catch’s “rule #1” is “clear water favors the fly fisherman”. No matter the rule’s number, there is no doubt the rule is right, the clearer the water, the better we fare against the fish. But fly fishers don’t use the metric “vis”, as it is measured in feet. If we could measure our fishing water’s visibility in feet, we wouldn’t even be concerned with it! Typically, for inshore fishermen, the visibility is in inches, usually expressed as “clarity” and it, too, is usually just someone’s opinion. But, there is an impartial, scientific metric for “clarity”. Science uses the term “turbidity” and provided a measurement system for it. Unfortunately, turbidity NTU’s or FNU’s, do not translate into inches, making it a great metric for science but not necessarily for fishing. But don’t throw the baby out with the “turbid” bathwater, we don’t have to be all that exact and we can use some relative comparisons to accomplish what we want. Luckily, many of the Internet accessible river and tidal gauges provide a reading for turbidity and those gauges can provide real-time values as well as historical values, which can be helpful in analysis. The readings from those gauges are at the minimum, impartial, unlike the opinion of a guide thinking about his pocketbook. For my own personal use, I do not try to get into or understand the different gauges and terms but rather relate the gauge readings to anecdotal experience and “rules of thumb”. Other people have done the same and below are some basic “rules of thumb” one can apply. Also, remember that FNU relates equivalently to NTU, and gauges typically read in one or the other. My own “rule of fives”, is the easiest to remember which is “5 is five feet, 50 is five inches”. No, that is not precise, but even the grid above is not “exactly” correct. So my “rule of fives” is close enough and it’s certainly easy to remember. An example of the former would be fishing marshes in Mississippi or Louisiana. These waters are cloudy, to say the least. To do sight casting in it I typically try to pick periods in the middle of the day when the water is low which forces the fish up in the water column, reducing the dependency on clarity. To fish the marsh I typically want visibility of at least 1 to 1.5 feet, so if the gauge is reading in the twenties, like it is in the gauge reading below, and I know that if the tides will give me a depth of 1 or 1.5 feet, I should be able to see fish. Notice the spikes, when I checked the depth, this was near low tide, meaning the water was running right over the muddy bottom, so the spikes would be expected and can be ignored. Everything has to be taken into account. An example of “fish sighting the fly” would be river fishing. The Mississippi River has a turbidity gauge at Natchez and though I don’t fish Natchez, the river flows at 5 miles an hour making it a safe assumption that the turbidity in Natchez and Vickburg are roughly the same. Back to my “rule of fives”, I look for a turbidity reading of 50 or less for the river. If you can’t see the fly in five or six inches, the fish probably can’t either and fishing won’t be good, based on experience. Of course, one can’t just take one reading and go by it solely. In the area I fish, there is more than one gauge. I read them all and compare the readings. Right now for example, the further back you go in the marsh, the higher the turbidity. What’s that mean? Well, because I have observed it with my own eyes, I think it’s just because we had little rain and no hurricanes and the back marsh needs a good flushing, but that’s just my opinion. But don’t forget other factors that can affect water clarity. In 2010 there was tremendous flood on the Mississippi River and my marsh trip to Louisiana was in the midst of it. I remember standing at the ramp and looking at the cafe’ au lait colored water and thinking “there’s no way we will be able to see a fish”. But, our very experienced guide took us back into some thick grass flats and suddenly I could see a shell on the bottom in two feet of water. Grass can clear up the dirtiest water. 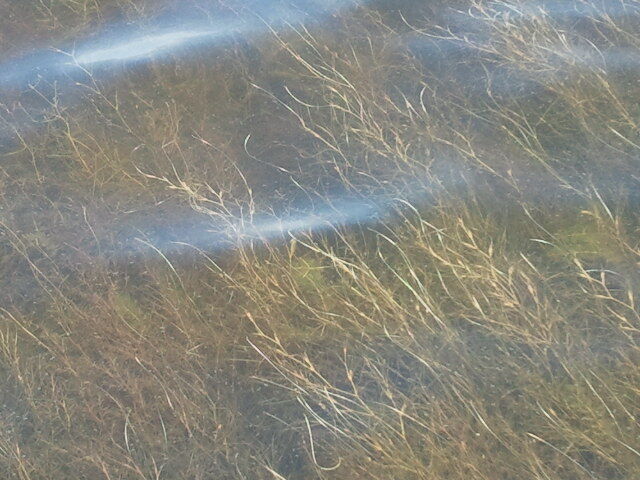 And the other nice thing about aquatic grasses is, red fish love it!